The rainy season has officially started on my side of the world weeks ago and this means one thing for those like me living in the rural areas..."rice planting time".... 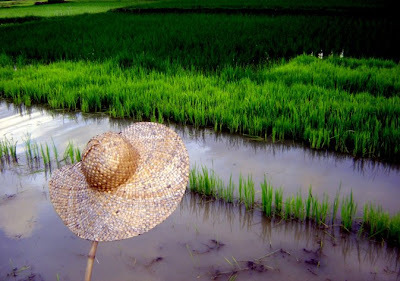 I love staring at the green scenery around our house as the rice paddies are filled with slender stalks that merrily sway with the wind. They need enough amount of water to thrive until the time they are transplanted in rows that to me look magical because I know that farmers have to toil from sun up to sun down to keep them viable until they are ready for harvest and then transformed into that soft, chewy white carbohydrate eaten best in moderate amount with native viands. 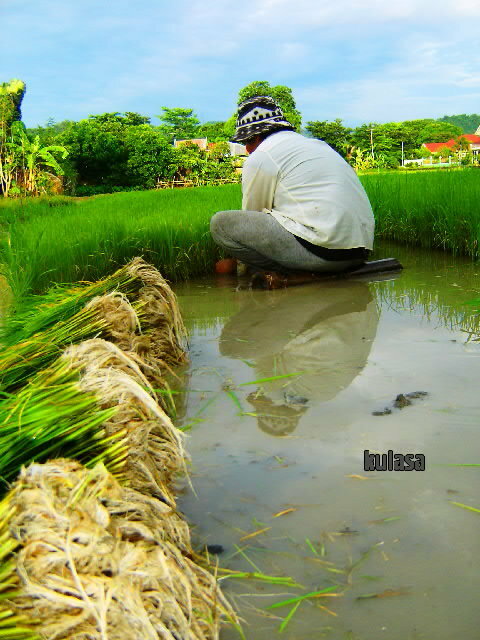 The following are shot on the rice fields surrounding our home sweet home. No, I do not own these lands but I fervently wish one day farming wont be as difficult as it is now here. 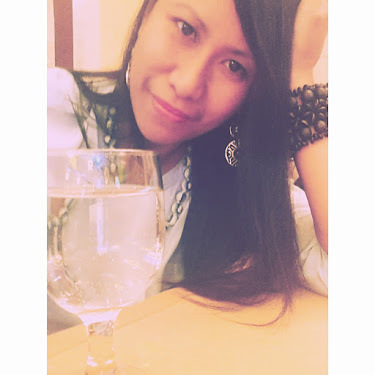 I remain a full pledged citizen of this country I so dearly love and no matter where I might be years from now if God and time allow I will remain that girl who loves eating rice with clean bare hands. Awesome photos. Thank you for sharing them. 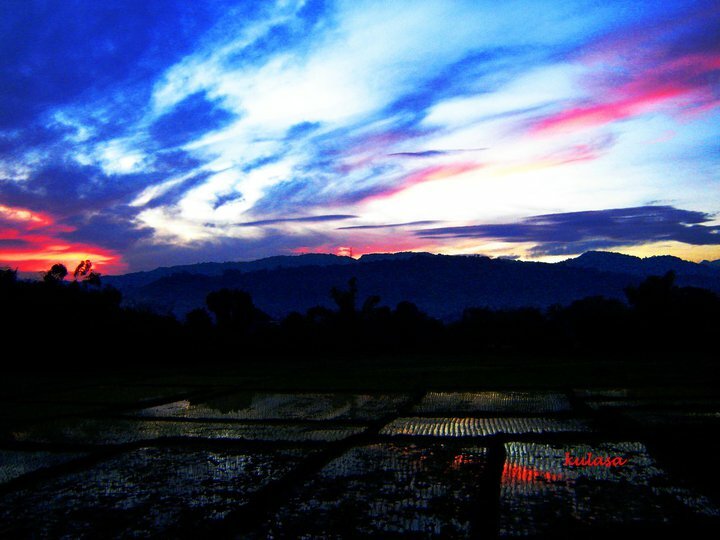 oh, beautiful colors of the sky and so peaceful scenery of the rice fields, i miss seeing rice field too, Zen. and like you, i never have given up on rice despite people blame it on gaining weight. i believe moderation is the key, which you stated so well. rice helps me become alive, haha, really, for if I can't have rice in a day, I tend to crave for a lot more foods, I eat more and I get terrible headache. 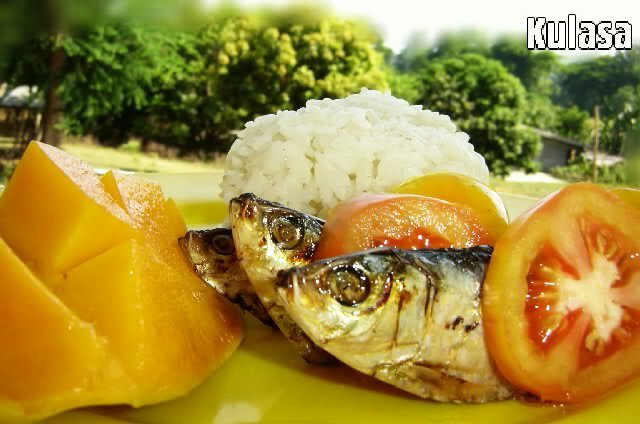 However, if I eat some rice, I don't have cravings for high cholesterol and salty foods, and I tend to eat rice in moderation and stick to more veggies and fruits, the diet I grew up with and more used to. Looks like an amazing time of year that requires a tremendous amount of attention. That looks exactly like my neighborhood, that I pass by everyday. These are beautiful shots, Zen! 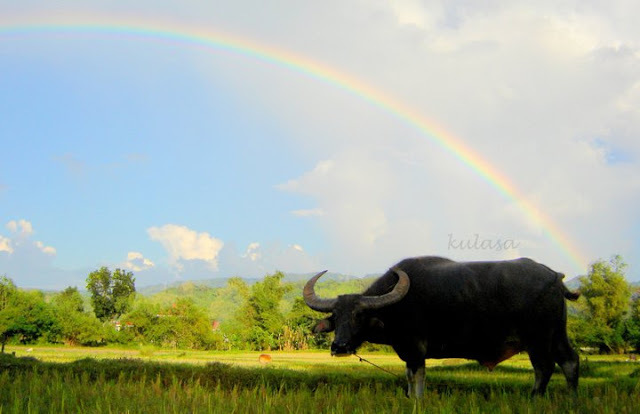 I love each one but the rainbow with the buffalo is fantastic. I need to have rice at least once a week! I would like to wake up to a beautiful view just like the one you captured! Ganda ng sky! Love the splashes of colors! Love the first pic. If we have that view here where I live, I'll wake up early every morning to see that. Beautiful shots! Such greenery and cloudy skies. I love rice too as it is a staple food here in india alongwith wheat. And its raining here in Mumbai too!!! i feel comfort just looking at those photos. so much homey. I miss home...so much! It's only there you'd see such beautiful sky and feel so relaxed. btw i like that praying matis photo...i can't hold that myself! A great photo and a lovely sky. I do think we have a kind of rain season at the moment in Norway too. The weather is not good! really breathtaking colours of the sky...and very relaxing image too!happy weekend from me! Your world is very beautiful, to be sure. you don't get that shot everyday that's for sure. Such beautiful sky colors and the rice field reminds me of home long ago when I was a child.